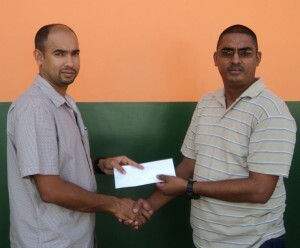 JR Burgers Manager Ryan Rahaman (left) hands over the sponsorship cheque to GMR&SC Manager Rayon Samaroo recently. With a mere seven days to go before the Guyana Motor Racing & Sports Club (GMR&SC) stages another Race Meet, the club received a significant boost for its preparation when JR Burgers came on board by offering its support recently. 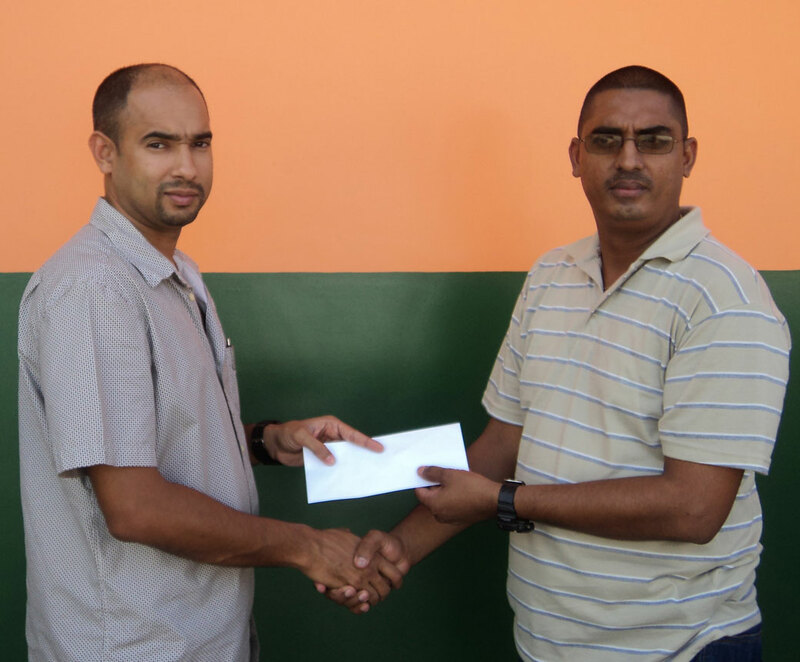 Manager and motor racer Ryan Rahaman handed over a cheque for an undisclosed sum to Clun Manager Rayon Samaroo during a simple presentation ceremony, at the business location on Sandy Babb Street, Kitty. Responding to the act of support on behalf of the club, Samaroo said that the assistance was a welcomed one to offset expenses for hosting the Meet and he is extremely grateful for such. He informed that 23 races are carded for the day including those in the go-karts, 125cc and Superbikes categories and those for the cars starting from the rookies, group 2A, 2B, 3 and 4 divisions. The additional incentive Samaroo stated will be the return after a hiatus of former Group 4 champion Mark Vieira, who it was reported will brandish a new car which insiders have predicted will shatter the existing lap record, especially with the recent improvement to the track. The organisers have promised a day of exciting races and keen rivalry with action set to commence at 09:00 hrs. The first race will be preceded by the Lap of Honour which commences from 08:30 hrs.